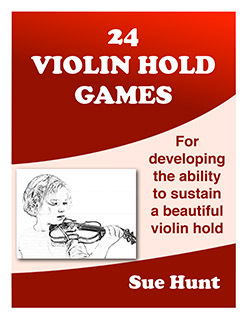 24 Beginner Violin Hold Games is a great resource of games and strategies for encouraging beginners to practice making and sustaining their violin holds. Use 24 Beginner Violin Hold Games to put a sparkle in group and private violin and viola lessons. Have you noticed how hard it is for some kids to hold a violin up on their shoulder without letting it slip in front of them? Some kids seem to spend more time complaining, than practicing. Even though the first lesson on holding the violin goes well, how can you be sure that kids keep working on it? FACT! !It can take thousands of correct repetitions to turn knowledge into a skill. FACT!! Children don’t like hard boring work and will do anything they can to get out of it. Detailed instructions for each game. Practical, easy to use Violin Hold pictures and charts. Lucky dip cards. These give your child a valuable element of choice and help you to customise varied practice sessions, specially for the needs of your child. ✓ 24 Beginner Violin Hold Games will engage your child’s interest, at lessons and in practice sessions. ✓ 24 Beginner Violin Hold Games challenges a child to keep a good violin hold for the duration of a game, just makes it more fun. ✓ Play 24 Beginner Violin Hold Games every day and your child will quickly learn to sustain a useful violin hold, even when doing the complex activity of playing. ✓ 24 Beginner Violin Hold Games will help a violin student will make a much better sound by helping him/her learn to sustain a proper violin hold before attempting to play. ✓ 24 Beginner Violin Hold Games will give you useful practice in gentle and respectful hands-on help. ✓ Discover the importance of making a winning team with your child with 24 Beginner Violin Hold Games. Within a few sessions you and your child will learn to appreciate just how well you are both working.